Your servant Thoth, the Ibis-headed Egyptian God, carries a bowl to hold your candle in this depiction. Heiroglyphics decorate the base of this majestic statue. Perfect for educators, scribes, and wordsmiths. 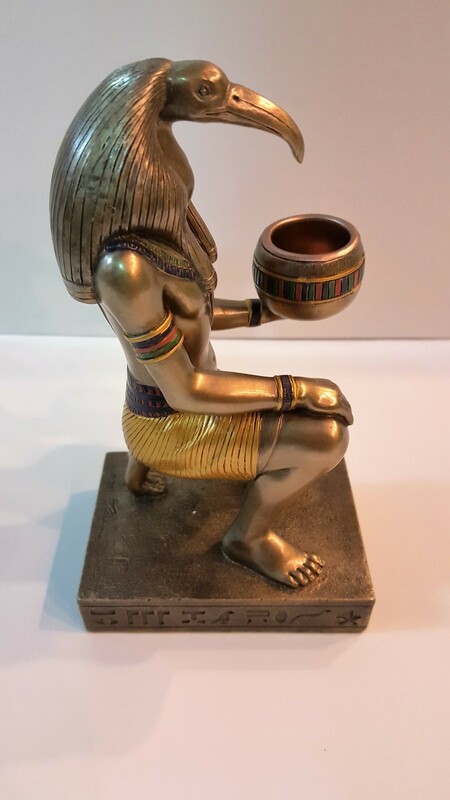 Originally named Tehuti by the Egyptians, Thoth was given his better known name by the Greeks. They linked him with their god Hermes, and like Hermes, he was considered to be the god of wisdom, writing and invention. He was also the messenger and spokesman of the gods and finally the lord of the moon. He is represented as a man with the head of an ibis, which is often crowned by the crescent moon supporting the full moon disk. He often holds a writing palette. Sacred to Thoth is the baboon. In Hermopolis, he merged with the local baboon god Hedj-wer. Thoth invented the arts and sciences, music, and magic, and was the god of learning, but above all, he was famed for being the creator of hieroglyphs, and was known as “the lord of holy words”. As the god who invented writing, he was the protector of scribes. Occasionally described as the tongue or heart of Ra, he is the god of magic, and was called “the elder”.